Saroj Saigal is a professor emeritus of pediatrics at McMaster University. Photo by Tina Depko. A McMaster University professor and pioneer in the health of extremely premature infants is being recognized with a major award from the American Academy of Pediatrics. 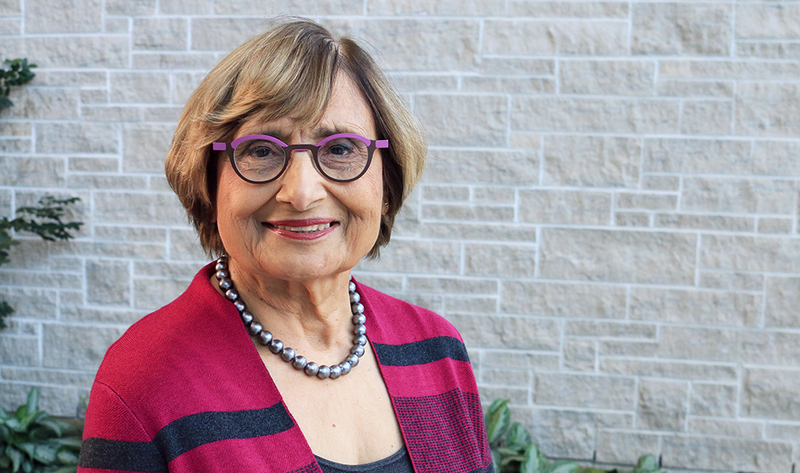 Saroj Saigal, a professor emerita of pediatrics, is the 2018 Virginia Apgar Award recipient. She is only the third Canadian to win the award, along with Robert Usher from Montreal and Jack Sinclair from McMaster. Sinclair was a professor of pediatrics at the university from 1970 to 1999. The Virginia Apgar Award is presented annually to an individual whose career has had a continuing influence on the well-being of newborn infants. Saigal was considered to be ahead of her time in child health research and neonatology, particularly babies born at less than one kilogram. She has had an illustrious career with McMaster University since arriving in 1972. Although she is formally retired, she has continued her work as a researcher at McMaster and a clinician at the McMaster Children’s Hospital. Her focus on the study of the lives of premature infants after they survived neonatal intensive care, and her compassionate and thoughtful approach to this study has been emulated around the world. Saigal is also the author of the book, Preemie Voices. Saigal will be presented with the Virginia Apgar Award during the American Academy of Pediatrics national conference in early November. She also will be inducted into the Community of Distinction of the Faculty of Health Sciences at McMaster on Nov. 16.